If you click the name of Ben Ling, you’ll see that he designed a bunch of very interesting concepts, especially Sony ones. 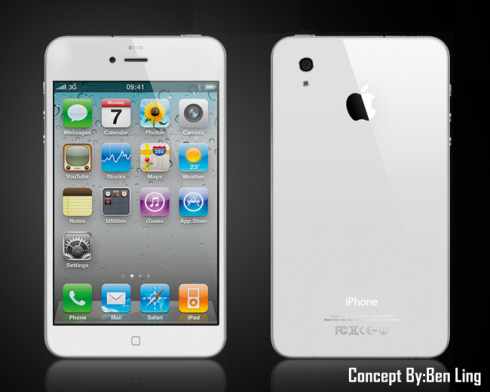 Now he’s back with an iPhone 5 mockup, one that involves a 4.8 inch Retina Display with Corning Gorilla Glass touchscreen. It also has a quad core 1.5 GHz Cortex A9 processor on board. There’s a 12 megapixel camera with LED flash at the back and the screen I mentioned above gives you 391 ppi, a very impressive performance. This iPhone 5 does HD video recording (1080p) and there’s also a front 2 megapixel camera with 1080p capture as well. iOS 6.0 runs the show here and we get iCloud and a standard Li-Po 1910 mAh battery, as well as 2 GB of RAM. 16/32/64 GB of storage, 1 GB of RAM and Bluetooth 4.0 fill in the gaps. This iPhone 5 concept measures 8.7 mm in thickness and weighs 130 grams. The latest rumors say that the new iPhone will only be a 4 inch affair, so we’re far from the huge diagonal of this mockup. Also, keep an eye out for the September 12th announcement of the iPhone 5, since it’s coming soon enough!